I hope this blog is an encouragement to anyone pursuing or contemplating adoption. Here are my favorite adoption books, which I heartily recommend. 1. 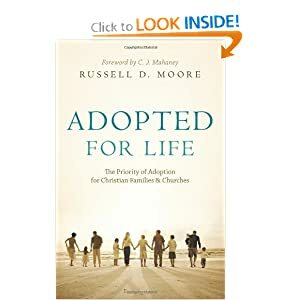 Adopted for Life, by Russell Moore--this book gives the theological framework for adoption: we adopt because God first adopted us. It provides a robust paradigm for adoption from the Bible plus the author's personal experience. 2. 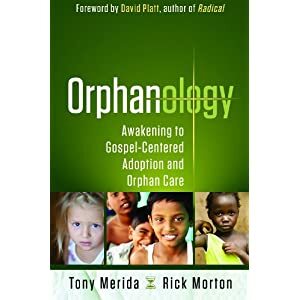 Orphanology: Awakening to Gospel-Centered Adoption and Orphan Care, by Tony Merida and Rick Morton--this book calls the church back into the act of caring for orphans, either through adoption or myriad other creative means. It's a great resource for anyone burdened for orphans but unsure of where to go or what to do. 3. 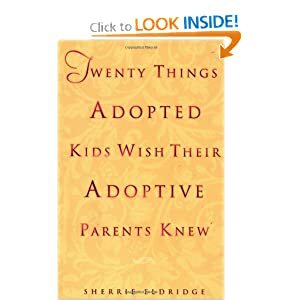 Twenty Things Adopted Kids Wish Their Adoptive Parents Knew, by Sherrie Eldridge--I just read this book a couple months ago and felt like I was reading about our very own family. It is tough, but truthful. The author herself is adopted. I'd recommend it to anyone who has had their adopted child home for a couple of years (it may be too overwhelming if you just brought your baby home). It was an encouragement to me. Eldridge also has a website at www.sherrieeldridge.com. 4. 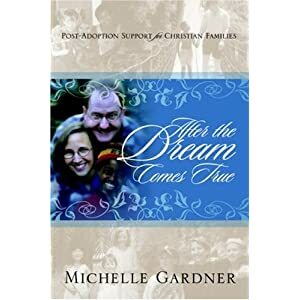 After the Dream Comes True, by Michelle Gardner--this book gave a hopeful and realistic look at what adoptive families can expect and prepare for. This tool is a Christian's guide to the book, "The Connected Child"--it looks like a 12-section guide for the book, along with Bible study tools grounding your methods as an adoptive parent in the Word of God. I'll let you know how it goes. I have read about 5 billion 20 books on adoption and could have easily listed a few more. A lot of them say relatively the same thing. A lot of them pertain to people adopting babies, not 12-year-olds, so I skimmed them. There is a lot out there. My main encouragement to potentially adoptive parents is to walk closely with the Lord and depend on Him alone for strength, wisdom, and guidance. The book of James says that God gives "wisdom generously to all without finding fault" (James 1:5). We have found this to be true many times when we have been confused and uncertain about what to do. I also encourage you (and ME!) to pray that God, "out of his glorious riches may strengthen you with power through his spirit in your inner being" (Ephesians 3:16). The strength to parent is not within us. It comes from God alone. And this feels even more true when parenting a wounded child. Lastly, dwelling on our Lord as an adoptive Father and meditating on the Cross and the lengths God the Father went to adopt us is hugely peace-giving. I am a sinful, imperfect parent. But He is not. He beckons me when I am distant. He pursues me. He provides for me. He loves me. While I was His enemy, He sent His son to die for me, that I might be His child. That is Truth. Meditating on Truth gives new life to this adoptive mom every time. Galatians 4:4 But when the time had fully come, God sent his Son, born of a woman, born under law, 5 to redeem those under law, that we might receive the full rights of sons. 6 Because you are sons, God sent the Spirit of his Son into our hearts, the Spirit who calls out, “Abba,[a] Father.” 7 So you are no longer a slave, but a son; and since you are a son, God has made you also an heir.